In stunning fashion, two wildcard teams have now reached the 2014 World Series. The surprising Kansas City Royals and the budding dynasty of the San Francisco Giants will meet for the Fall Classic, and it has all the makings of an enticing competition to determine baseball’s world champion! Neither team has exceptional superstars, and yet here we are in late October with these bunches of over-performing players ready to embrace immortality and a World Series title. For the Royals, the team is built around a tremendous bullpen and a bunch of speedy runners capable of stealing bases in the blink of an eye. Meanwhile the Giants have a more balanced squad and the experience of winning two World Series in the last several years. For me the key will be Kansas City’s questionable starting pitching. Both James Shields and Yordano Ventura haven’t quite played to their best while only Jason Vargas has been impressive. If the Giants can get up early in games, they may be able to win this series. However, if Shields finally plays to his true value, the Royals may just claim a title in their first postseason trip since 1985. In many ways, most casual baseball fans will be hoping for the Royals to win this Series. They’ve endured so many disappointing seasons and there really is the feeling that this will be their only chance for many years. They’ve earned their place here with a late-season surge and have gone undefeated in these playoffs. If momentum is any guide, the Royals should be well on their way. But if anyone can overcome a hot team it’s the Giants. They’ve won 9 straight postseason series and have won the World Series twice in the last four years! Starters Madison Bumgarner, Tim Hudson, and Jake Peavy have pitched marvelously while their bullpen is no slouch either. Hitting wise the teams are quite evenly matched. While the Royals lacked power in the regular season, their big bats have come alive in the playoffs, especially that of Mike Moustakas, who has 4 postseason home runs. The Giants have good hitters too, and anyone with a decent memory can recall the glorious blasts by Pablo Sandoval in the team’s recent championships. All in all, this is a tremendously matched World Series and could very well go either way. While my heart wants to see the Kansas City Royals win an unexpected title, I think the current dynasty of the San Francisco Giants will continue, largely due to their remarkable starting pitchers. Everyone knows that pitching wins titles, not stolen bases. It has been a remarkable run by the Royals, and their momentum could definitely push them ahead, perhaps even leading them to a sweep, but I think that the Giants are simply the better team. Remember that they have only lost two games in these playoffs and are on quite a hot streak as well. The 2014 MLB season certainly has been a special one and it’s coming to a tremendous close. I think the Giants will get to have the last laugh though, and they will win it all in 7 games! 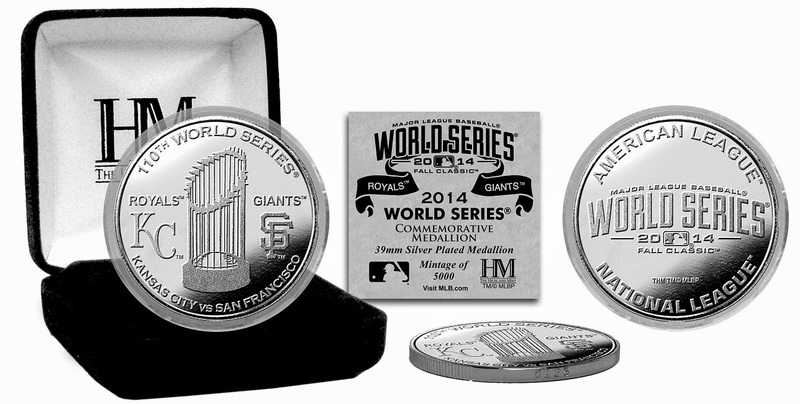 Doesn't matter which team you are rooting for to win the World Series, we have collectibles for both the Kansas City Royals and the San Francisco Giants. Our autographed memorabilia is guaranteed for life to be authentic as they are obtained from the most trusted sports companies in the industry and our autographs are done during paid private signings with the athletes. We also carry officially licensed sports collectibles and display cases for all MLB teams. New products are added regularly so visit us often to see what is new.